* Limited to certain file formats and Samsung devices. i.e. Meaning the software does not recognize files like .avi. * Only designed to apply to phones and tablets that have been produced by Samsung company, it is not compatible with other Android devices like HTC, Motorola, ZTE, LG, Sony, etc. How to Sync Samsung Photos/Videos/Music with Kies? Run Samsung Kies on your computer. Navigate to the left side panel and select a data category. 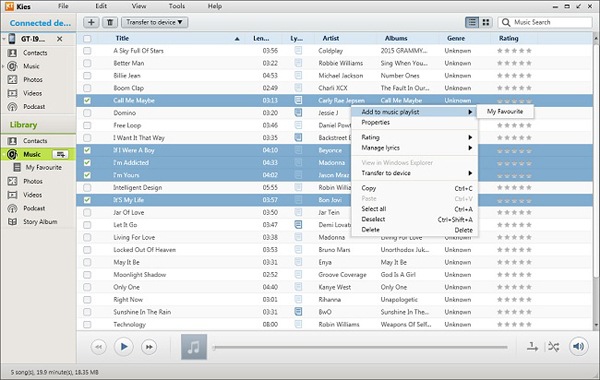 For example, we select "Music" in the Library column and press the "+" button to add music files to the Library from the local folders. 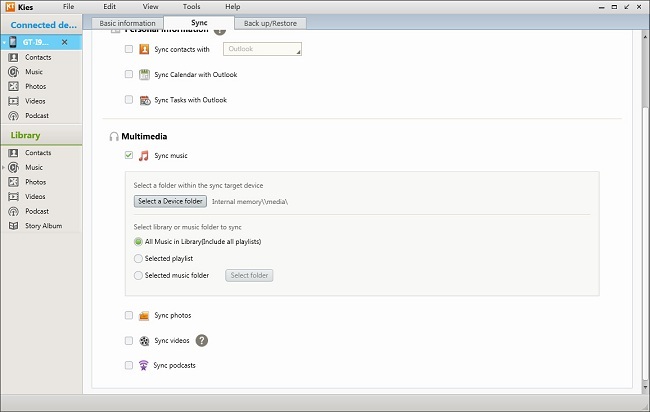 Connect your Samsung phone to the computer and once the connection is enabled, you can click the "Sync" panel from the top interface, tick the files you need in the Multimedia section and hit on the "Sync" button at the top-right corner. When the synchronization complete, you can check the files in your phone one by one.